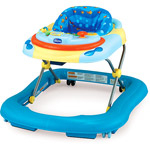 Our walker offers hours of fun for babies beginning to explore the world around them. Removable play tray offers a snack area for dry finger foods. Safe and sturdy, for babies up to 25 lbs. Colors and styles may vary.